The Pioneer XDP-100R is an aptX-compatible source that confirms its connection to an aptX speaker when paired, but that didn’t happen with the Sonica. Contrary to what you might read elsewhere, the Sonica doesn't support the aptX codec, a fact I confirmed with Oppo. As it turns out, it doesn’t matter. 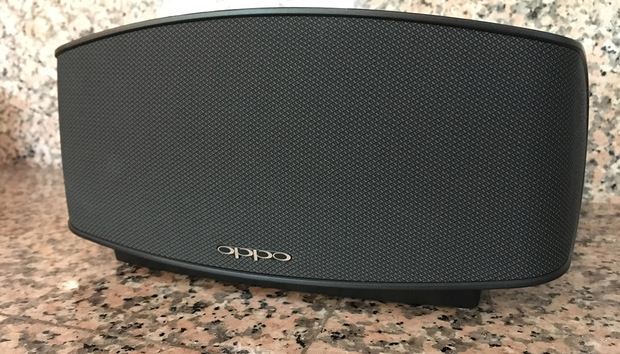 During my time with the Sonica, I did experience a few anomalies that Oppo has apparently fixed with a firmware that was just released towards the end of my review period. The new firmware, labeled 19-0816 (August 19, 2016) addresses occasional Bluetooth disconnections (stability) and playback glitches. I experienced a bit of both during my review period. With no particular pattern, the Sonica’s audio would blip—kind of like what you get when you are in a car and a lighting strike interrupts the radio transmission. I was able to perform the firmware upgrade easily enough (this requires connecting the Sonica to the Internet--it can't be done via Bluetooth). With the Sonica connected to the Internet, I launched the Sonica app an bingo! It prompted me to install the firmware update. The update took a few minutes and appears to have solved most of those anomalies I experienced. If you’re a Sonica owner, make sure you update the unit to the latest firmware. Knowing how Oppo stands behind their previous products, you can likely expect more firmware updates as Oppo finds solutions to other minor issues. I’ve been using Adele’s 25 for a number of reviews lately, and the Sonica just nailed the album, delivering the best top-to-bottom rendition of “Send My Love” of any Bluetooth speaker I've auditioned lately. Adele’s voice was enveloped by the instruments with just the right separation and balance. Bass lines were simply awesome. They attacked with an archer’s precision—thwap! Always in full control, the Sonica never allowed the bass to get loose or bloated. Piano and strings in “Love in the Dark” were naturally smooth with a strong sense of timbral accuracy.